Cafe Mediterranean offered a couscous salad for a limited time. I liked it so much I ordered it every single time I went to Cafe Mediterranean, that is until they stopped serving it. 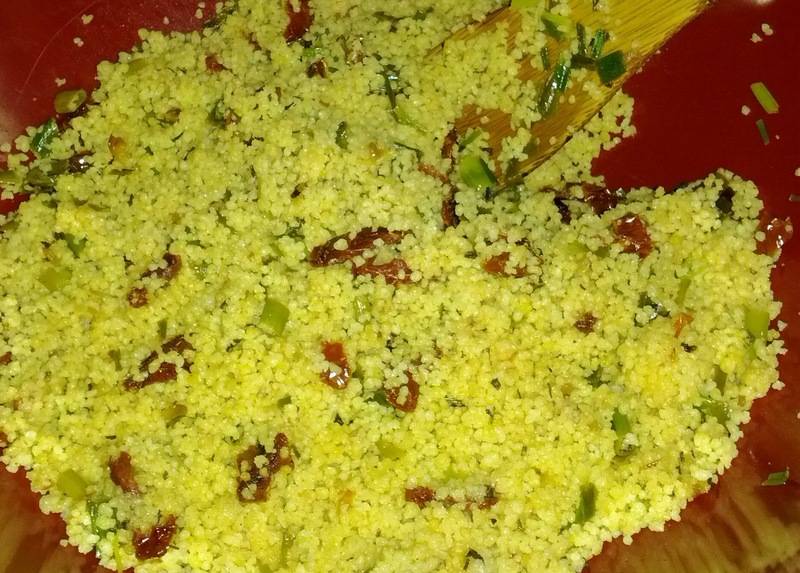 That particular dish ignited my love affair with couscous and even more so, sun-dried tomatoes. Truth be told, I always have a big jar of Bella Sun Luci sun-dried tomatoes in olive oil with herbs and spices lying around in the house. I use it to make all sorts of pasta dishes and I eat it together with fried fish. Yum! And when I found a bag of dehydrated Bella Sun Luci sun-dried tomatoes in the grocery, I was beside my self in glee. I would snack on it like a normal person would potato chips. Since I missed having my couscous salad at Cafe Mediterranean, I tried to make my own at home, using a recipe from AllRecipes here. The photo above, however, is a variation of the original recipe which came about mostly because I was not able to get portobello mushrooms and fresh herbs. I find this an easier recipe to work with because it calls for ingredients that are easier to keep for longer periods of time in the house and hence readily available whenever the craving hits. Place the sun-dried tomatoes in a bowl with 1 1/2 cup water. Soak for about 5 minutes. Drain, reserving water. In a medium saucepan, bring to a boil reserved sun-dried tomato water. Stir in the couscous. Cover, remove from heat, and allow to sit 5 minutes, until liquid has been absorbed. Gently fluff with a fork. Heat the olive oil in a skillet. Stir in the sun-dried tomatoes, garlic, and green onions. Cook and stir about 5 minutes, until the green onions are tender. Mix in the basil, cilantro, and lemon juice. Season with salt and pepper. Toss with the cooked couscous to serve.